Abstract artist and sculptor, Cheryl Williams, created this strikingly simple, yet elegant, spiral sculpture. I love the vibrancy of the swirly reds against the copper center and black base. It feels like we’re embarking on a journey into an emboldened portal. 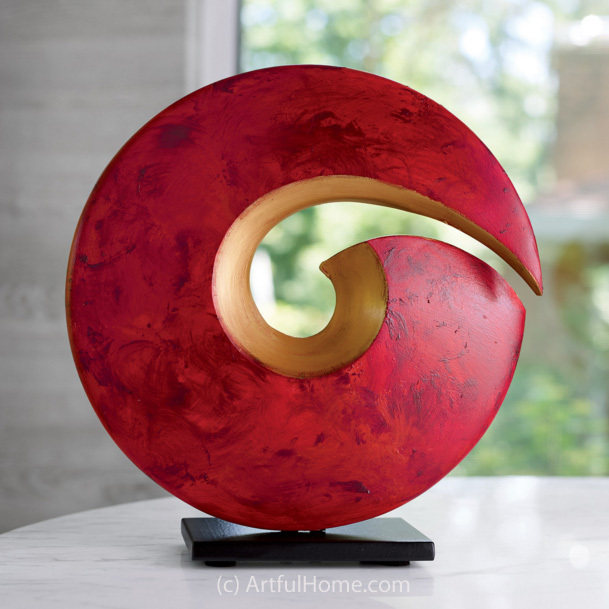 A simple form with great presence, this wheel-thrown ceramic sculpture is carved by hand and finished with vibrant red and metallic copper acrylic paint. Sealed with lacquer and mounted on an included black iron base. The energy that comes through my heart and into my hands stirs great passion in me. The light that is within all of us is reflected in my work. Bringing essence into form, I make the ordinary appear extraordinary. My work is simple and elegant. It gives me great pleasure to share this with you. View more of her stunning sculptures via her online gallery.